TMBOY is an electronic “shadow pop duo” formed by members Sarah Aument and Will Shore. Their music has an organic feel, courtesy of Shore’s live vibraphone performances, mixed with elements of house and techno which serve to amplify the emotion in Sarah’s lyrics. Jingle writers by day, indie artists by night, TMBOY’s music combines synth elements with irresistible melodies and well-crafted lyrics that capture their audience’s attention and won’t let go. Deals with a troublesome snare drum using techniques like pitch shifting, distortion, and transient design. 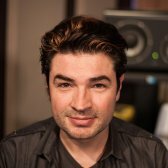 Uses metering and gain staging techniques to set himself up for delivering to streaming platforms. Balances multiple bass synth patches against each other and creates space for each to avoid masking. Once the mix is complete, Fab recalls the original mix that he did for the record to compare his on the fly, in the box mix to the version that went through multiple recalls and made the record to see which one wins. Good morning, children! Today I have the great pleasure of being able to spend a few moments with you mixing a song from one of my favorite bands in the entire known universe: TMBOY. The song is called "The Light." It's from their current album, it's out now, you can go check it out. And to keep things interesting, I'm not going to use a template, I'm not going to use presets, I'm not going to use anything complicated. I'm going to mix it In The Box as I go and explain everything I do. Here we go! I mixed this song a long time ago, and to be honest with you, I don't remember what it's like and I definitely don't remember what I did. What we'll do after I mix this is we'll probably go to my actual mix from the actual record and compare and see who wins. No artist! is I can do whatever I want, and I don't have to stick to the aesthetic of the record. So this is purely an exercise in: here is a track, mix it in the void. The first thing I'm going to do is listen to the rough mix that Will and Sarah sent me. You know what? While we're here, let's put markers in. I would say we should call the top something like 'TOP', and then go from there. Let's put an 'END' marker, say here. What a delightful, wacky song structure. There's no chorus, there's a bunch of breaks with nothing in them, there are like three verses, there are two bridges. It is the anti-radio song, so I love it. These guys, Sarah and Will, spend most their days writing commercial music. They're very good commercial music writers, meaning they write for ads or they write music for movies or industrials and stuff like that. They're good at it, and they're very fast, so I guess when they're done working during the day doing that music that has a lot of boundaries, they make music that has no boundaries, which is probably why I love the band. I called the sections whatever I felt. I like to mark a section that has just the beat because that allows me to work on just the beat without muting the vocal. Does that make sense? So that when I get to the verse, for example, my vocal is not muted. So I rarely, rarely mute the vocal, so I will do anything to not have to mute the vocal in case I would forget to turn it back on, if that makes sense. You got to force yourself to have good manners. The 'Breakdown' with that weird, little arpeggio was pretty cool. There is another one, I called it 'Longer Break'. I called the third one 'Even Longer Break' because it felt that it was going to be longer, but I think it may be the same as the 'Longer Break'. So those are the very arbitrary section names. I'm sure if you ask Will or Sarah, they'd tell you, "Dude, that's the chorus!" but since everything is a point of view and I'm by myself, I'm going to call it this. As you can see, this session fits on the screen. I don't have to scroll, I can see every track on the screen, and on this one, if I go into the small fader mode, I can see every single track. Isn't that wonderful? I love it. You'll see that the only thing that's been done on here, so we all understand what's going on, is I color-coded the tracks with my color-coding. Green for drums, red for bass, pink and purple for the keyboards —there are no guitars here. You know what? I'm going to make the background vocal orange just to really follow protocol. The only thing I've imported from the session is the actual objects for the reverbs because I know I'm going to need them, but there are no plug-ins on them. So I have an Aux for Lead Tail, I have an Aux for Lead Space, I have an Aux for 8th Note, and then I have the Spread, but there are no plug-ins on them and I want to choose them in front of you. Everything in this session goes to a Sum Bus which is connected to this Aux right here, and that Aux is then going to a Print Bus which is connected to this object right here. This button right here will switch between dark, like this —in which case we're listening to what's on the track— to green —we're listening on Input, to our current mix. So, for example, if I go to the verse, this is Will's rough mix. And this is the rough tracks without his mix. Obviously there's no reverb, it's pretty dry. A narrow mixing object mode is kind of against my religion, so I'm going to go back to the wide mixing mode, and I want to keep this here. The other thing I'm going to do is I'm going to switch my metering because right now I'm on Pro Tools Classic, which is a little bit like getting your information from La Pravda in Russia in 1960. Not reliable, so I'm going to switch to K-14. Why that? Not really because I'm using the Katz metering system, just because that's the meter that's the most appropriate, in my opinion, to allow you to function within the loudness meter range, meaning, I know this is going to end up on Spotify or on YouTube or something like that, right? They're not going to make a CD out of it, they said, and so I know I'm going to have to deliver songs and spot check them with Spotify to make sure I'm in the ballpark of what they like. And to do that, I like my mixes to be roughly at the same level as Spotify, and that is -14 LUFS-ish. So even though this is not a LUFS meter, the K-14 meter of Pro Tools, it is close enough for jazz, and so, I'm going to set my meter there so that, in general, I can take a look and see that I'm in the ballpark. If I wanted to be very precise about this, I would probably use a loudness meter like either the Waves Loudness Meter, or the iZotope one, or whatever. But for now, we're just going to be really zen and enjoy music and not be technical. However, we are not going to be technical, with manners, and I'm going to make sure that I don't hit it too hard. The other thing I want to do is I'm going to do something a little unusual. I want to start by putting a limiter on the two mixes, so I want to go to, say, for example, Dynamics, and I want to go UA, and use the Sonnox Oxford Limiter. I love the way this limiter sounds, so I want to use that. I want to open the Attack here because I don't want to, you know, ruin my transients. All I want is to have a general gain of the whole thing, and I'm going to place the general gain of the track because basically the balance is good because Will is really good. I'm just going to give myself a little bit of gain here so I don't have to give myself as much gain from the different tracks. You'll notice, if I go to the actual track and I put the waveform at a regular size, you'll notice that it's all very quiet. This is usually what happens when somebody who has skills and technique works in Ableton Live. For some reason, the exports from Ableton Live always end up coming in really, really quiet, so I'm going to give myself some gain. The vocals are wicked loud, obviously, but if you listen to the beat section you can tell that, you know, 5 or 6 dB of gain bring us in the vicinity of something acceptable, so I want to start there. The next thing I'm going to do is I'm going to make myself some VCAs because I'm not going to do any stem mixing. I'm going to mix straight to a stereo Sum mix, so, for those of you who are not interested in going through a really complicated signal path, I want to show you different techniques that I usually do. But still, even though the session is pretty small, I'm lazy. I'm going to create a VCA Bus for just the kick drum. Trust me, there's a reason for this. And I'm going to call it 'vBD', and it doesn't follow any Globals. I don't want it to have any Attributes. I don't want this Group to do anything, I just want it to exist. Be. And then I'm going to make one for the rest of the drums. I'll call it 'vDRUMS', same thing, no Globals, nothing. One for just the bass. All keys, including the Vibes, why not? 'vKEYS'. ...one for the lead vocal. And one for background vocals. Although that's kind of an overkill, why not? And here is why I'm doing this: I am here, and I'm going to create a bunch of VCAs. Bass drum, drums, bass, keyboards, lead vocal, background vocals. I can count to six. It's amazing! I can do jazz. ...vBD, vDRUMS, vBASS, vKEYS, vLEAD VOX, and vBACK VOX. So now I'm on the right of my session, I can go anywhere in my song, and I can solo the bass drum, and I can solo the drums. I don't have to go back to the other side of the session. I have command control here for all my tracks very easily, and that usually is nice. I can also do general moves pretty easily and not Bus as much, so this is one good way to use Pro Tools to streamline the workflow. Of course, Pro Tools doesn't understand how to name the object after the Bus you assigned to it, and that's because Pro Tools is very young and it's still growing. Name your tracks! There you go. All right! Bananas! So for example, from here I can say, "You know what? Let's take a quick listen to just the vocal." Hear that? Do you hear that, like, sharp edge "Aaah" and that bump of energy there? We're going to have to address that. This is all very well done, there's just that little peak there, and then, when we listen to it in context, we'll see what happens. Now, I know from his rough mix that his intention is this. That's not my music, it's their music. ...SuprEsser to try and find that spot. I'd say it's around here, with this stuff. "We thought that," it hits you in the nose there. I'll compress it a little. Do you hear the difference? It makes a huge difference. This artifact of the recording is now gone. I'm going to leave this as is for now. So what kind of support I'd like to give this vocal, timewise? Well, I need a nice, lush stereo reverb. In those cases, unless it doesn't work right off the bat, I usually go to the EMT 250 because it's really glossy, so I'm going to assign the vocal to that. I'll use the 'track' function here and go to Lead Tail. I want to make it closer, I don't like that pre-delay. I want the vocal to meld into the reverb, just like Will had it. But maybe not as much as Will had it. not a chorus, but kind of a shine, an ensemble kind of thing, and for that my favorite has always been SoundToys MicroShift. I like III for this kind of stuff. What I want to do also is I will organize my Sends in order, meaning that, you know, I have four receiving objects for vocal reverbs, so I'm going to use Send number four so that it's easy to track what goes where. It's geeky and it's OCD, but, it works. I'll mute the reverb so you can hear what I'm doing. So if you notice, check it out. This is with the spread. Notice that putting the MicroShift on brings a little bit of heaviness, just a little bit of heaviness to the vocal. That's something I don't need. I'll play it again. This is without. Listen to the bottom of the word "day." I like what it does to the spark, but it's bunching up, so I will use just a simple high-pass filter. It doesn't have to be fancy, I'll use the built-in Avid one so you see how it works. This is free, people! And I'm just going to go way up high. Until I no longer hear the difference. I don't really like what happens when she's starting to hit a little hard into the 250, so I'm going to compress the Send to the 250. I'm going to use a basic Oxford. What I'm doing is I'm taking the Send and before it hits the reverb I'm compressing the signal that goes into the reverb, which means that when she sings louder the reverb is not going to respond as much. If you pay attention to the difference here, this is without the compressor. Do you hear that extra energy in the low mids? Check it out. This is with the compressor before the reverb. So the reverb is a lot more even. I will have to season that to taste, but doing it this way allows me to not have the reverb freak out on the loud parts and still get that really nice lush thing on the soft parts. Control, control! That's pretty good. I think I'd like to give her a little bit of distance, like a little bit of depth, so I'm going to put an Oxford there. Why the Oxford? Because I'm used to creating that effect with that. We could do it with another reverb, but this is really simple and easy to explain. I want to put that in the Space slot, Lead Space. I'll mute the other ones so you can really see what I'm doing, but I usually would not mute the other ones. I was not going to use presets, but this one is pretty badass, so there you go. Exactly what I wanted. Just a little bit of distance, right? I'm happy with this. I don't think we need anything else, for now. The Reverb Time on this Office preset in the Oxford reverb is 0.45 seconds, and a pretty small Size, right? We're trying to imitate a small room so that it doesn't sound like she was so close-miced, and it does the trick. A little too much of the spread, but it's kind of addictive. We'll see in the sauce. Let's listen to the beat now. Instead of using solos, I'll mute everything and unmute the things I need. All right, let's do the beat on the Beat section. Okay, so, hm, it has a lot of personality, right? But it's got holes in it. It has a little 'oink oink' I don't like. I'm going to give it a chance to behave and remove that 'oink', which I think is going to be in the 120 Hz area. I'll loop that so we can work in peace without being interrupted rudely by the software. That's okay. I want to remove that tail of bottom, hear how he goes 'boo-koom boo-koom'. It's like there are two kicks, right? 'Too-ga too-ga'. I think we are going to need the venerable RBass, our friend who's always here in time of needs to give it the sub. So I'm trying to connect the point, the 'puck', and some sort of bottom that's of value. I think it's a little too dynamic, which, you don't hear me say that very often, so I want to compress it. It definitely feels more stately. I'm going to unmute the vocal. That made me want to carve some space in the 500 Hz area to leave her some room. to have that thing it does sometimes when the bass drum feels a little forward in front of the bass drum, but not louder, just a little forward. And usually to do that, once I have the right bass material, what I do is I add a little bit of this dude. It comes free with any Apollo you buy, which is great, and it's very useful. I think I can help it further by carving a little more here, maybe a little higher. It was actually a little lower. So what I'm doing is this: I'm adding some bottom. Because it's a Pultec, and it's a shelf, and it's very broad, it's also bringing some of that 100-ish area stuff up, which I don't want because it gives that nose, so I'm carving 3 dB at around 100 Hz to remove that stuff that the Pultec has brought, so now I'm doing this, right? So pulling this back, pulling some 500 Hz back, putting this in, I can choose which parts of the kick peek through so that the vocal feels like it's floating above it. There was a little bit of a level discrepancy here. Let me try and match the levels so I'm not lying to you. I need two dB of gain. I'll solo the bass drum to make sure that the pre and post is the same level. It's the same level distributed very differently, right? We distributed the energy of the bass drum from here to here. It does the trick, right? Let's see the rest of the pocket. I'm going to loop the verse. It's a really special sound, it's got a lot of personality, but it's not shining where it's at. First, it's a little wooly around 200-ish, I think. I always like to fix what I hear is a problem where there is too much of before I add anything, because if you add something, you're going to add more than you need and it's going to mask the problem, and then you're going to fight with it for hours, and we don't have hours —there's cocktails later! I still feel that it's a little kind of 'uh'. It's cool, I like the personality of the song, but it's not peeking, it's not going through, so let's try and give it a little bit of energy by using distortion. That clap will definitely use a truckload, which is the technical term of this. And you know what? This clap, I really want to hear it in stereo today. I don't remember if I did that, but I want to make this clap stereo. It's an urge I have. It would be very fascinating to see if I did that on the original mix or not, so I'm going to use the spread delay trick. No delay on the Left, 20 ms on the Right, maybe 30, maybe 10, I don't know, and it sounds like this. Now, EQ'ing the clap, I don't want it to have this, but I do want to have less bottom on it. It's also loud as hell. And I'm going to get rid of that meat around 500 Hz because I know it's a problem. So let's check our levels here with what we've done, because most of the energy is here, right? It's all right. There is no 2-Bus compression, the limiter is doing nothing, it's all very reasonable so far. I think that I'm going to run into a problem with this. I don't think that the drums are hitting hard enough. I might as well just already create what I'm going to need because I know I'll need it because I've done this before and I got bit before. So I want to create a new mono Aux Input and I'm going to create a Bus at the same time since Pro Tools has the kindness of doing that for me, and I'm going to call it, say, 'DRUM CRUSH'. And I want to send that to the same Sum because, you know, we're In The Box. And I'm going to make it solo safe so I can hear it. I'm also going to change the color because we want to be consistent, and I want to use a dbx 160 because it's badass. I love this plug-in so much that I went and bought some hardware to have it also in hardware. That's usually the other way around, but that's the way I did it for this one. So, I want to put them both Pre-fader so that I can solo my Crush. So you hear what it's doing, it's that [mouth noises]. is bananas! because you can make it do this. So, what else can I do here? We should listen to the soul of the song, which is that bass thingy. Actually, right now it's registered as a keyboard. I think that's not good, so let's change that. So, to do so, I want to make this happen this way and I'm going to change the vBASS Group, and I'll Replace by these two that I chose, and I'm going to go to the vKEYS Group, Modify it, and tell him to no longer consider Juno part of the band. And I'll change the color too, I want to make the Juno kind of like the honorary bass. It hangs with the bass but it's not the bass, it got a degree later for having sold records. So whether you consider this Juno a bass or not is a question of taste. In my world, it's a bass. I'm putting an EQ on. It’s a preemptive EQ move. I think we need a little more harmonics on this so we can hear it better. Check it out. I can hear it, but I can't really feel it. I like to use Tape Head for that. It does just that. Isn't it amazing? Wonderful! I love this thing. So this brings us to the fact that the honorary bass is a little too fat. It fights with the other bass. Check it out without the EQ I just made. Well, just a simple high-pass, it sounds like this. Listen to the red bass and the orange bass, together. We don't miss anything from the orange bass, but it no longer fights with the kick or the red bass, which is great. I want to solo the two of them so you can really hear that difference. This is without the correction. But you really can't tell in the sauce that you just emasculated the honorary bass. Already, my dynamics are creeping up because of the Drum Crush, so I have to be very careful with that. I'm going to be a good citizen and lower everything a little bit. Let's listen to the rest of the keyboards. I'll have you know that Will is amazing at vibes, marimbas, anything that you can bang on with mallets, and so he gave me two options and I'm going to respect his wishes and use the wet vibes, not the dry vibes. He records everything in his apartment, he has a lot of vibe-like instruments in his apartment. He records everything by himself and does a pretty amazing job. There's a little bit of a bunch up, that's going to be a problem, so I'm just going to get rid of it and do this. Check it out. This is the vibes without the high-pass. It doesn't change the nature of the sound, it just changes that 'nnn' thing. It allows me to put it louder too. Of course, you're noticing that the vocal is getting buried a little bit, right? Check it out. So the natural urge is to push the vocal up, but as you just saw me do instinctively, which is why I'm commenting on it, is I'm starting to bring things down to leave the vocal where it's at. I'm looking at my meter over there, which you can see it here too. Very reasonable, but it's moving a little bit fast. Maybe we should do something about that. Let's use something, you know, standard edition, from my good friends at UA: the SSL 2-Bus compressor. How do you spell SSL? Aah... right, like this. What I'm going to try to do with the SSL compressor is to slow things down, slow the needles down so it's not so dynamic, so that I have more density. 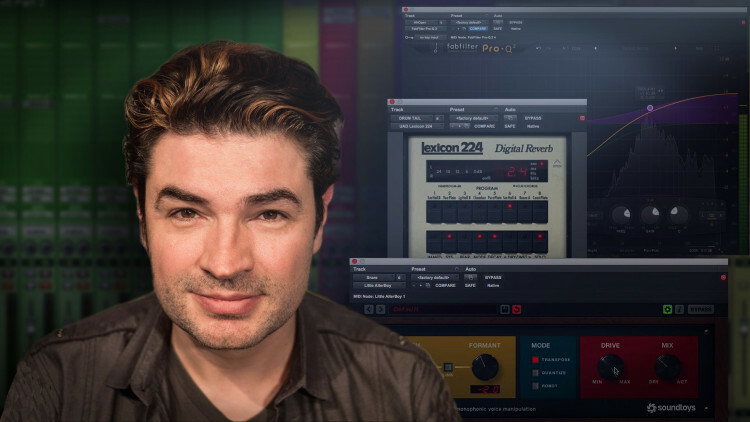 There are a few ways you can use a 2-Bus compressor. In this case, I'm going to use parallel compression. If you were not to use parallel compression, you could use it very simply, like this. It brings everything in, does the little high-pass thing that the SSL compressor does, everybody is happy. You could push it further, you could say, "I'm going to super-compress, open the Attack, and get some punch." So now that's starting to sound bad, but if you tuck that in by doing parallel compression, by reducing the amount of compressed signal and augmenting the amount of dry signal, it sounds like this. So that gives you extra punch, but, the needles are now slowing down. Then the other thing you can do is go back to full compression, done here, and have a very fast Attack and have a slow Release. Obviously the needles are slowing down, and now you tuck some of the direct signal back in. And you achieve your purpose, which is more girth, more density, you get the transients from the direct sound, and you get this, like, mush from the compressed signal. The other thing you can do here is high-pass the Sidechain so that the bass drum doesn't get touched by any of this. That works! From these three experiments, what made me happiest, I think, was the least amount of work, which is open Attack. Let's do the Automatic Release and see how this works. And now let's try the Sidechain. I like it better neutered. Maybe not the very, very bottom. It brings a nice, kind of like, togetherness to it. Let's see if it holds. Usually, when I'm working with my entire system, I have a limiter on every stem that does a little some some, and then I have my 2-Bus chain which we'll probably see when we open the real mix. I'm going to use the Universal Audio emulation of my trusty Dangerous Music BAX EQ Master. Yes, master! I will high-pass the very bottom of this, even though the SSL is already doing it by design. I'm not sure it was an intentional design, but that's what it does. But this one I have control over. Since the levels are creeping up a little bit, I'll go down 1 dB on my limiter. Then, I'm going to add a little bit of general air. Let's try 18 kHz and go from there. That thing on her voice. I'm going to lower the parallel compression on the drums a little bit. The vocal has a space, the honorary bass has its own vibe, right? The vibes are really wet. Like they have a room to them, but no tail, so I think it's time to put some space. So I'm going to click on the Vibes track and I know I'm going to want to put the Vibes and that Juno thing into some sort of a reverb, and I'm going to call it 'TAIL', so I'm going to use the first Send. And I'll make it Stereo because, you know, we got used to stereo, and I want to call it 'KEYS TAIL'. Now these two tracks are assigned to that Tail, I'll put the Tail in the right spot, which is after all the keys, just as a mnemonic for me to know where it is and not have to look for it. I'm going to solo-safe it, assign it to my Sum Bus. I'm going to find some sort of something. Usually on keys is fun to have a little bit of metal, and I'm going to use the EMT 140. I may or may not like it. We'll see. Just the Juno for you to hear. That's too fat, right? It's muddy. It's not working for me today. It's punished! Let's use something else like the Softube TSAR-1. So, I want something bigger than that. I really like the color of this. I want to open the Time. So now with the vibes in the reverb it's pushed back, so I have this distance between the vocals and the vibes, which is awesome. I'm not 100% sure about the Juno yet. You know what? I'm not going to even bother with that, I'm just going to high-pass the Send, so I'm moving the reverb down one slot. I'm just going to high-pass what I send to it. So now let's take care of the drums. That clap needs something —something obnoxious. Will is not here, I don't have to be tasteful. I owned a RMX reverb, let's use it! There you go. Boom! Maybe a different Program. I don't think that's legal. I can't stand that thing! There's that chorusy quality to it on this clap. Usually I have no chorusing problem with the Oxford. I may get some hate mail about this, but I don't care! So then, I'm going to add something to that snare, right? It's a little kind of 'uh'. And I want to create the space separately so I can also put the clap in it. Let's call it 'Drum Tail' for now and see what happens. I usually put the names of reverbs in all caps so I can separate them from the names of the Buses. So this is a reverb, so I want to make it yellow, solo-safe it, and send it to the Sum, and see. Usually I really enjoy the Lexicon 224. Actually, I should have tried that on the clap, but I'm happy with the Oxford. Let's open the background vocal. Recorded the same day, obviously, so I can use the same tricks. I'm going to use the same reverb since we're not doing stem mixing. I'm just going to add a little more spread. The background vocals would benefit from being compressed with a very fast Attack so that nothing gets in the way of the lead vocal. So I hear a little bit of a mask on the bass drum. This actually was where I thought it was. So this is on Verse 2. As we did on the snare, just for space. I like this to be present, and it feels good in the sauce. So let's listen to Will's reference. I was able to enhance his tones, but his groove is better. Why? Because the subdivision, the upbeat, has a much more important role than I had gotten used to by listening to my tones. So all this subdivision stuff is more important than the hard-hitting stuff. I like my tones better, obviously I had time to work on them, but I think his vision of the groove is better, so I have to adjust. So this causes a problem because I really don't like the sound of this thing in my face. This thing being the open hi-hat, so I want to make it brighter. By having it brighter I can lower the fader, and I still have the presence but not the technicality of having all this energy in the wrong spot. So I'm hearing something pumping, something funny, so we should look at the 2-Bus compressor right now. Maybe if I bring in the Attack a little bit. I don't like it, so I'm going to compress a little more. So I'm comfortable with my balance. I'll raise the vocal here because I do need it and I don't really want to readjust everything else. So obviously my mix is louder than Will's mix because things are creeping up. That's part of the joy, so I'm going to lower my limiter back down. So I think the parallel compression on the snare is too much. I think the snare needs some love in the bottom. Cool! The drum fill is here, check it out. I've got to take advantage of that, but to do so, I'm thinking something obnoxious like SoundToys Devil-Loc Deluxe. It's deluxe, it must be good. Wooh! Check that out! More Crunch. I'm still not happy with the snare. It just feels dull, and it feels better with a little bit of 10 kHz. I'm able to get the spirit of his mix. I'm really there, I have better tones, I'm getting there, there's still some magic missing. The question is: where would the magic be? To look for the magic we shall try this. I'm going to listen to just the drums for a second. Let me shorten that reverb. The reverb-to-clap ratio is not ideal. Maybe a little less stereo on the clap. Again, I feel the snare is just... I can't like the snare. Let's see, maybe a little Alterboy. That's a choir plug-in, so I'm clearly not supposed to use this for this, but I don't care! There's too much reverb on it, but this is interesting. What I did with the Alterboy is I played with the Formants. I'll solo the snare so you can hear it. I distorted the hell out of it. I could also try and pitch it. I think the clap is still a little too fat. I'll remove more of the middle. like, add some 5 kHz to the snare. It gives it a bit of a stereo thing. Why don't we reduce the stereo? Because it doesn't sound so good. Too much of a Formant. Let's try this. This is nice! Let's see if I can make the bass drum fatter. So I can push the bass drum a little and I'll make sure that my high-pass here is accordingly adjusted. This is starting to sound a little more vibey, right? I think we can go higher on the snare, a higher frequency. So let's bring those basses back on. I misread what it does for the song. It really is kind of like the whole song. Obviously, since it's the intro, I think it needs to be better taken care of. I want to try something like a little bit of saturation. This plug-in usually works great for this kind of sustain stuff. Also, I often use it on full mixes, it's called the Precision Maximizer thingy. I think I went a little too fat on the snare. That's a good vibe! If I do the same trick where I make this a little brighter, I can take it down a little. I still feel like I don't have the presence I need, even with the Maximizer, so, I could gate it to try and do that, but that's going to pump. I could do, like, some transient stuff. Let's see if I can get the [noises], that 'kkk kkk kkk' thing to come out. No, not the Inflator, the TransMod. Let's see if that one works. It works like a charm! Let's see on the verse. So clearly the magic comes from that Juno thing, and it's much, much better now, so that was a big misjudgment on my end. I think we could use more of this. ...clap, on this. You never know. Don't give up'cause you have AMS.See? Don't give up! Yes sir! It's better, it's not great. Also, it goes 'pa pa ka ka hmm' and I don't really like the dynamic of that, so, who needs dynamic? Dynamics are for wussies. Here is this, what people would do. So you may have noticed that I put one Juno on the left and one Juno on the right. That's just a reflex I have when there is a lot of stuff going on. It sounds great, the bass, but I need to high-pass the very bottom. On its own it's fine, with its friend it's crowding. As you can tell, I'm still being annoyed by the snare and I tried to add 10 kHz. I tried adding more 5 kHz, same problem. Let's see with less 300 Hz. I'm really liking the trio of this, I think this sounds bananas! Remember I used a RBass and I put some 60 to give it girth. Now that I have the Juno back forward maybe I can drop the RBass from 60 to lower to make some room. I need a little bit of that punch. For these kinds of, like, really compact bass drums, usually the SPL Transient Designer works wonders. Check it out. Pretty cool, right? And then, I have a Pultec here, I might as well use it. So clearly this guy is going to need some reverb. So now I am very tempted to open up the top of the vocal. Just the very, very top, like 16 kHz and change. I see a printed delay here from Will. I'm sure it's good, I trust Will, plus it's in there. If he took the pain to print it and put it in the session and call it 'Vox Delay' and put it next to the voice track, I think he needs it, so I'm going to use it. The clap is still too wide. Let's go and try 5 ms. The Juno is awesome but it doesn't shine, so let's use the same processing as the other Juno. I sense some automation in our near future. There's still something that doesn't hit right on the bass drum, but we're close. It's too much of that bottom. And I can have more of the direct sound. I may have overdone it. That sounds good. First verse. I think there is room for a smidgen of compression on the vocal so that the levels are more consistent, and also so that I can get a little more presence by opening the Attack and bring the vocal forward. See how on "to sleep" the energy of that goes down? With. You know what I mean? Check out this phrase again. I don't know, how long have we been doing this? Two hours? Three hours? Eight hours? Days? So check out the phrase, listen to the top of the phrase and listen to "to sleep." See how it goes behind the snare, right? Now with the compression. It stays there, but it's not compressed when it gets to that point, it's just compressing the louder part so everything is a little more steady. And since the Attack is quite open, it doesn't really change the tone of the voice. Let's see what it does on the first verse. It's really starting to sound like a record. Let me see the other fills I've missed. There's one in the Whirlwind right here. Less, and put some tail on it. What's this? Something that has a lot of low mid transient energy, let's take care of that. Let's push it all the way in the back by adding some of that reverb on it. So now you can really hear it all the way in the back. There's something cool, 'Chicka Chicka'. I find it's very similar to the 'Clave'. So there is another Juno doing the same thing with a little variation, so let's just not reinvent the wheel. Let's listen to Verse 3 from Will's demo. I think that the subdivision problem is solved, right? I'm going to use the background vocal to do something fuzzy. And make it feel far away. I like where everything is, I think the tones are great, I think it hits hard. For some reason, I kind of feel like it hits harder than the mix I did for the record. On the Oxford Dynamics there is a little thing here called 'Warmth'. It's not warmth, it's an Inflator. It's like a very limited Inflator, but it's limited in a good way. It makes the vocal jump out. I like it. I use it on vocals a lot. Let's scrutinize our 2-Bus processing. I dig this! I have this irrepressible urge to put a little bit of this for some reason. And there's a little too much of that 30. Notice how my levels here on the right are close to zero. But a little loud, so I'm going to lower the output of the SSL to get to a more reasonable place. Now, lowering this right now is going to create a vacuum in your ears because we've been listening to this at a certain level and I'm going to take it down X amount of dB to try and gain-stage my stuff. Now, doing that is going to feel softer, which means it will feel underwhelming, so you have two options: either you decide you will get used to it, option A, or option B, you just raise your level. I recommend you get used to it, but if you can't get used to it, raise your levels. What I'm going to do now is I'm going to listen on headphones. So, obviously, you may have been listening on headphones since the beginning. I haven't, I've been listening on my SM9s. In my process, there's always a segment in which I listen on headphones because that allows me to see the extension and the movement of the very bottom, which no room will give you, even this amazing room, and also, it's going to allow you to listen to the song the way people are going to listen to it since 98.8.3.3 percent of people listen to music on headphones these days. Let's go to the second verse because it's got the most amount of stuff. ...Spirit Pros and just check it out. It's really important that you don't blast yourself with the headphones. First reaction: the bass drum is not loud enough. And also, I'm kind of neutering it here. Let's see what's happening on the high-pass filter. That really is a sweet spot, so, let's see this one. That makes a mess, so let's find something else to give it that 'oomph' thing at the bottom. I want something fairly precise. You know? I don't need to reinvent the wheel. Let's just use this guy —this guy is great. It does some of the job, but it's not making me super, super-happy. Let's try that Softube thing. I don't remember, but probably we'll see it when I recall the real mix, and maybe this is the closest to that. So this is Softube's kind of like vision of what that thing is kind of like-ish. Let's go in the bottom. And let's go pretty narrow. I'm going to need less of those transients. That is pretty nice! I'm at 230 Hz right now. If I lower the Shelf and give it a little more gain on the 2-Mix, then everything should come together a little more. This is where we're starting. All that's pretty nice, but let's try anyway. Check this out! When you are at 230 Hz, listen to the top of the kick. Now listen at 166 Hz. It tucks under nicely, just this little descending part is nice. And the way we were before was 1 dB at 230 Hz. Check out the top of the kick. It doesn't have the inspiration of this. I have to check my low-cut filter. It's all about masking a relationship, but let's check the low-cut filter. So 36 is nice, it's got that 'oomph' thing, but now it's muddy. Maybe a little less of this. So I like that, so what I'm going to do, I'm going to come back here and have a little less gain. I wish I had the in-between, not +2 but +1, especially on the Active Equalizer. I don't, so it's a compromise. I don't think it's the end of the world and I think that we really gained the bottom of the kick. We'll see when we get back on speakers, but I think this is really becoming nice. Let's see the transition from the intro to when the beat comes on. We can say it hits hard. I think the tone is great, but now, with all this new energy, it's maybe 0.5 dB louder, or something. Something bothered me in the upper range of the bass drum, apparently, long-term, I'm not able to make the compromise. Do I want to go back and screw —technical term— with the Active Equalizer or with the BAX? Nah! I'm just going to cheat. Let's listen to the instrumental, for example. I think that the second bridge Juno could be louder. Let's see what Will meant. I think I made the same mistake here. I think this is already affected enough, I think it needs its own space. I think it needs more of this. Let's see if this is better. It doesn't need the Crunch, but it could use the density. A little too fat —just a little bit, just a little bit. Let's put this in the middle. I think that on headphones... And I may regret this, so I'm tracking my steps, right? I know that I just raised the Drum Crush by 2, almost 3 dB. I feel it's beneficial to the kick, but not to the snare, so I'm keeping track of my steps. Eh! Maybe I'll try 3 dB less on the snare Send. This is all very approximate because it's so compressed. If I undo that and undo my 3 dB, it sounds like this. If I redo both, it sounds like this. I think the snare is very deserving. So I like the relationship between the bass drum and the snare drum, better that way on headphones. I'll make sure that it's the same on the speakers. So the bass drum is too loud, but it sounds bananas! I think this constitutes a very good 1.0 mix, especially since we did it on the fly with none of the systems I have to gain speed. What I propose we do is I print it, because we've heard this enough, and then open the actual mix from the actual record, import this mix into it, and then compare, and then I'll show you what I did then, and maybe compare with what I just did, which would be, I think, very, very educational. I usually select markers when I print the song. Why? Because if I select the markers 'TOP' and 'END' every time I print the song, every single print is phase-accurate and exactly the same. Et voilà! Let's switch to the other session. I just opened the last session of the last mix for "The Light," for the TMBOY record. It's version 1.3, which means I mixed it once, and then recalled it, 1.1, recalled it, 1.2, and recalled it, 1.3, so this is a pretty belabored mix. I have here the MeldaProduction MNotepad, which I use on every song to take my notes at this point. I tend to leave it open so that when I open the session it's the first thing that hits me and I can't miss it, and I can't say, "Oh, I forgot to recall," because it's there. So it says on V1.3 I used an HD Native rig with a Buffer at 1024. Let's check the Buffer. The Buffer makes a difference, because if you print stems with different Buffers, the latency is different, the compensation is different, and then you're in hell. So you have to make sure your Buffer is the same on every session, at least for mixing and recall. And the 2-Bus, which is up there, is flat, meaning I'm not using the Paralimit, I'm not using the Harmonics, I'm not using the transformer on there. At zero, no processing, nothing, all flat. And then I have the Liaison. So the Liaison B: Insert 1 off, Insert 2, Neumann, On. +2 dB at 40 Hz. This is money, you'll see. So I Flip, and then I'm in the Insert Loop, and the Return of the Parallel Return is at noon. So this is the Parallel Processing Loop of the Dangerous Liaison, and it's these compressors that are in that Loop. And I need to have the Link on, the Gain at 0, the Threshold at 0. Attack at 100 ms, and the Release at 300 ms.
Insert 4 is the BAX. I'll make sure the BAX is on, and HPF at 30 Hz. Nothing at the bottom, +0 dB at 166 Hz. +1.5 dB at 7.1 kHz, low-pass at 70 Hz. Insert 5 is the Dangerous Compressor. Bass Cut, Sibilance Boost, Smart Dyn, Soft Knee, 1.4:1, with the Gain at noon, and the Threshold at +1. Because I'm in Stereo Link, I don't have to handle the bottom buttons, except this one. And then, Insert 6 is the Manley, and the Manley is +2.5 dB at 20 Hz. Kind of like the stuff I did on the Pultec, would you believe? And +2.5 at 12 kHz, and then, the transformer is on, but at 0, we just saw that. Back through the Dangerous Convert AD+, with the Transformer on, but none of the Emphasis. And here we go! So this is my session, the same exact tracks. It should all be the same. Interestingly enough, here I used automation, whereas in our earlier mix, I don't know if you noticed, but in the end there was no automation nowhere. There's not a lot of automation here, there is just a little bit on the Juno. Everything else is actually working just with the balance, with no automation. A little bit on 'Juno DRY', and a little bit on the vocal, probably because of different gain-staging. First, let's recall the mix. Let's make sure that it sounds the same, right? So I'm going to shrink this a little bit so I can see better. I had not put Memory Locations, probably because I was in a hurry. Let's go to the second verse and see what happens. A little bit different, isn't it? That's the joy of working with hardware because I can tell you that my notes are extremely precise. I kind of like today's mix better, actually. I think that this mix has a much fatter bass, but doesn't hit as hard. Let's see! So I'm going to create a new Playlist and call it, New, 'THE LIGHT PUREMIX V1.0'. I want to go to my Finder. Let's go fish for the mix that we did earlier, 'TheLight PUREMIX 1.0', and drop it on that Playlist, and synchronize it. So now we're able, by using the same magic green button, to compare between this afternoon and now. Of course, we're going to have to level-match because the odds that I completely level-matched this thing are slim to little. I sort of kind of level-matched it somehow. Maybe this afternoon's mix is a little louder, like, maybe 0.5 dB, 1 dB-ish. Isn't that fascinating? Let's start from the beginning. This is what we did today. To analyze really the parts that matter, like the drums, let's listen to the beat place. So I'm going to do one round of the beat from this afternoon's mix, and then I'm going to go on Input so we listen to my mix from ages ago. I have to lower today's mix a little more. So we notice that what I did today is brighter and that the kick has more punch, but we notice that there is more glue on the mix from the other day. I'll play it again. That bass drum really hits hard. Let's see with the vocal. Basically the vocal is the same, right? There's just a little bit of a difference in volume, but the vocal is the same. I think that I like the bass drum better today but I like the snare drum better in the old mix. Let's look at the old mix. This is fascinating! This is fun! I should do this more often in my free time. By now we've been discussing it long enough that you will recognize this stuff, the exact same tracks, so just a quick background on how the session is organized: everything is going to a bunch of Stems that are right here. Unlike the previous session where the bass drum was going to the Sum Bus, here, the bass drum is going to the Bass Drum Stem, and on the Bass Drum Stem I have a limiter which is probably not getting hit very hard. Let's find out! It's getting hit nothing, but there's also an extra 'last-minute, last-chance-before-the-desert' EQ, and there is a Send to a parallel compression system with this 1176 AE here. Somehow I decided not to use parallel compression on this mix. All that sum of those things is going through the 2-Bus. The 2-Bus is coming out, going into the Liaison, the Liaison is going through the 2-Bus mix I just described, and that's going through the Convert AD+, and the Convert AD+ is going back into this Sum Bus, and in this Sum Bus I have a little bit of a push at 45 Hz. Remember I was looking for the same thing on the mix this afternoon? And a limiter which is probably not limiting. The limiter is just hanging out. All right! That's it! Now that you know everything routing-wise, let's look at what I did different. This is really interesting! Let's look at the bass drum. The first thing I see on the bass drum is I organized some sort of a reverb on the bass drum. Check it out! I'm going to make it loud so you can hear it. It's at -13. It does that little thing of bottom that I didn't have before. So, on the kick drum itself I'm removing 500 Hz. Here I was bothered by 50 Hz at the time. A little bit of compression like the other one, a little bit of Transient Designer like the other one, so I basically did the same thing. I also lowered 300 Hz. And guess what? RBass at 36, so it's all basically the same stuff. Let's look at the snare. That is so much better than what I had this afternoon. Why? Okay! An Eventide! So, why would anybody want to put an Eventide on the snare? Because one loves David Bowie! And so, this is the same exact snare and I'll prove it to you right now. But, the Eventide does this. That 'fff fff' thing gives it more thing. I kind of did the same thing with the... Was it an AMS or something? Tape Head, so I used Tape Head on this one instead of Decapitator at the time. I removed a little bit of that wool at the bottom on the EQ. Aha! Removed that transient that I didn't like, that I tried to hide with so many things. I just removed it with the SPL. So basically the same thing I did this afternoon, and here's the AMS. My goodness! Then I have a Reflection Engine. Which, frankly, I couldn't tell you why I did it. With the same thing: a push at 5 kHz, a push at 16 kHz. So, when you see nine plug-ins on a track like this, it means struggle. It means that I just didn't know what to do with it, just like you saw me screw with it all afternoon. Basically, I don't like the snare, but because he likes the snare and it's his record, I left the snare and I did the best I could with it. Why an AMS and then a Reflection Engine and then a Pultec and then a Studer? It's basically, as you go through the mix, you have ideas like, "Okay, maybe if I soften the transient, then it will work," so you put the SPL, and then that softens the transient, and at that moment in time, it feels good. Or maybe on the second recall it feels good, but on the third recall, because you added something else in that space, it feels kind of dull and then you add some Pultec, but if you add some Pultec it brings the transient back out, so you're going to add the Studer. So you could go back preemptively with other things, but when you work with someone and very often that person says, "I love it the way it is! Don't touch anything! Just, like, a little of this or a little of that," and then you can't touch anything because if you touch something and they're emotionally attached to what you did, then it's the biggest can of worms in the history of the universe, so you tend to add things. Personally, I'm pretty emphatic about going back and saying, "Look, I have this, I can recall it. How about we go back here?" But with Will, since we work together so much, I know that when he says "I love it," but he says, "but there's just this little thing missing," that means that I need to go further in processing to give it a more vibey, more processed vibe. They're not looking for purity here, they're looking for something that has its own very particular tone, even if it's lo-fi. So, that's why I did that, and that's why you might see this. Now let's look at what I did with the clap. So, same idea I had, but I did it differently. I crushed it with Tape Head —I was in a Tape Head mood that day. Same thing, removed the bottom of the clap. Spread it, 5 milliseconds, exactly the same thing. And then I added some high end, but here, I used the Send and I sent it to this fantastic AKG reverb. And what did I do on the open hi-hat? Exactly the same thing. A Lexicon. I used the Lexicon, it's kind of falling in the same spot. I love that, what I did with the RMX on the bass drum. I don't know where the idea came from, but it's a pretty good idea. Let's see why the bass is fatter. Oh! Guess what? The parallel compression is exactly the same. So even though I started from scratch, did not use my template, did not remember what I did, I tend to have done the same thing. On the fills I used Devil-Loc. Wow! But I added a reverb on this one. Let's check this out. It's much better with the reverb, I should have done that. Fired. Next! I didn't touch much of the rest. Let's see why the bass is fatter here. Probably fatter because of the way the 2-Bus chain reacts, not because of the processing on it. I high-passed it, removed the stuff that bothered me around 100, and compressed. I compressed it here, I did not compress it this afternoon. I don't know. Let's see the main element. The main element is this dude. I made it brighter, same thing. I don't remember if I did that. Transient Modulator. Goodness gracious! I went heavier this afternoon. And then I high-passed because that's who I am. Okay! Kind of the same thing. And I copied the settings to the other Junos. What did I do on the Vibes? I high-passed them and sent them into the reverb. Here I used the 140, wide open, high-passed, sounds familiar. How much of it did I use? A lot! Basically the concepts, the instincts, what this song made me want to do, is basically the same, which means that I had a mental picture in my head of what I wanted the song to sound like. The end result is in the same family, kind of like a first cousin kind of vibe, but the process is pretty much the same. So that tells you that there's not "a mix" for a song, there's, like, a bunch of mixes for a song. Do you mix it in a vacuum, as a single? Or do you mix it as part of a record where you have to match different songs to get a record vibe? It makes a big difference. Now let's see what I did on the vocal because that's pretty fascinating. So here I processed the vocal quite a bit. The plug-in is on but it does nothing. I removed a little bit of the bottom, which I did not do on the other record. I have a little of compression. I have the Warmth at 100%. But I'm almost not compressing. Let's see what happens on the big ones. This is what I did: I actually did pre-compression leveling using Clip Gain, and I probably removed some breaths and stuff. That's what I did here, probably because that's what I did in the other songs. Instead of compressing the vocal I went and Clip-Gained the different phrases so that they worked together before I compressed, probably so I could use less compression because that's the mood I was in at that moment. The other difference here is I have parallel compression on the vocal. The same thing that Andrew does. I actually ripped this from Andrew, which is, I know, pre-emphasis, compression, de-emphasis. I add my own stuff, which is, I like to de-ess that so that it's not in my face. And also, if there's a problem, I also suppress it here, but it's nice to give it girth, right? Just a little more presence. Reverb-wise I used a 140. That's a pretty short one. That's my depth, that's the thing that I did with the Oxford this afternoon. And here is a really long Oxford, so I basically reversed my instincts. This afternoon I did the Tail with the 250, and I did the 'Office' for the room with an Oxford. Here I did the exact inverse on the record, probably because that was imported from a different song where I did that. So here the long is done with the Space. I'm going to mute the other reverbs. And then, this is the short EMT. The EMT works nice as a little, short kind of room thing. I have a delay here. Hear that? I didn't like that this afternoon, and I have a spread with the MicroShift, same one. So the difference here is I used parallel processing where I did not this afternoon, probably because there is parallel processing on the vocal and every vocal on that record. And I used the same reverbs as the rest of the record, whereas this afternoon I started from scratch, so my inspiration was to use a 250 for that glossy thing instead of an Oxford, which does the job very well, and to use the Oxford for the room as opposed to the EMT, which, I didn't remember I did that and I kind of like it. Also, there is here something called 'End Throw', so let's find out what the 'End Throw' is about. The 'End Throw' is about nothing. It probably was something I did and Will came in and said, "Ugh. Nah! Don't do that," so, it's gone. What did I do on the background vocal? What I did on the background vocal is I copied the processing from the lead vocal. And then I put its own reverb instead of sending it to the same reverb, and it's just a simple, normal, 2-second reverb, like a Hall kind of vibe. And that's it. That's all I did. On the 2-Mix there is nothing because everything is done in analog, except for that little punch at 40. So I have 2 dB at 40 on the Neumann, and another 3.8 dB at 45 Hz. That doesn't mean that there is 5 dB in that area. Because of the compression and the interaction between the different processing, it's just like little touches of things that let you compensate for other things taking away your bottom. If you compress a little bit here and some of the bottom has gone away, then you put the compression after. If you think about it, this EQ right now is after the compression on my 2-Mix, which means that the Dangerous Compressor is pushing against it, the transformer here is pushing against it, maybe I'm hitting the Convert AD+ really hard to get a little bit of that crunch, and so then I decided to compensate with a little bit of 40 Hz under because I felt like I was missing it. Let's listen to see if it was valuable or if I'm out of my... mind. Nice and generous, just the way we like it! By the way, we wanted to listen to the Neumann. This is with and without the Neumann. So there you have it! An In The Box on the fly mix versus a recalled and recalled and recalled analog summing plus all sorts of analog stuff mix. I have a soft spot for the record mix because of the snare, and also because of the general density which is a little easier to get with, you know, a pair of LTD-2s in line, but the In The Box mix is not that far. I'll let you be the judge. Thanks for watching! Et voilà! TMBOY is Sarah Aument and Will Shore. Together they create shadowy electronic pop that has an unusually organic feel for music that leans heavily into house and techno. As a songwriter, Aument’s vocals expose the difficult process of understanding who she is, while Shore’s vibraphone playing and production amplify the emotion in each lyric. TMBOY is Sarah Aument and Will Shore. Together they create shadowy electronic pop. It has an unusually organic feel for music that leans heavily into house and techno. As a songwriter, Aument’s vocals expose the difficult process of understanding who she is, while Shore’s vibraphone playing and production amplify the emotion in each lyric. Hi, Fab! That is inspiring. Thanks for the video and comparing different days and different equipment used for the mix (ITB or OTB). It shows one more time that the vision of the sound of the exact song doesn't change over time. So informative and inspiring....dig it! Great walk through. I especially appreciated the final comparison to your original mix. This video was *way* deeper than just a discussion of the SSL comp on the 2-bus (I think that's how it was advertised in the pureMix email I received). As always, thank you for sharing so much of your time with us! Fab is a very goof teacher! This Tutorial is great. Great video, Fab! I was wondering about your take on the UA Sonnox stuff vs the native versions. Noticed you used both, here. Drun Crush! Best one so far.